When the Abou Ben Adhem ("May his tribe increase!") 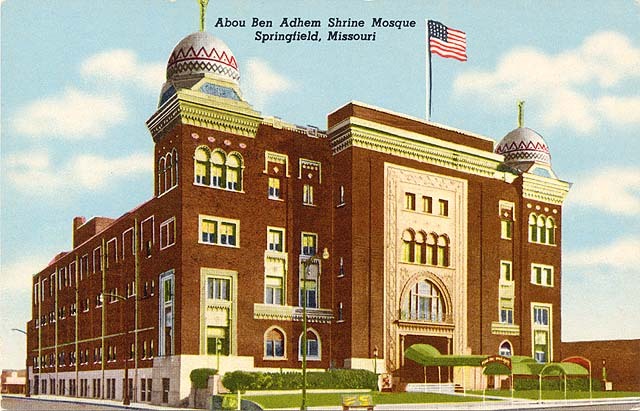 Shrine Mosque was built in 1923 it was hailed as the largest auditorium west of the Mississippi. It is one of Springfield's most recognizable buildings with its red brick walls and terracotta polychrome turrets. The Saracenic, or Moorish, style of architecture was the design of Springfield architects Heckenlively and Mark. Two stained glass windows designed by Stanley Uthwatt depict a camel caravan. The cost to build the Temple was $600,000. 4750 people can be seated in its main auditorium. At the time it was built the stage was second only to the Metropolitan Opera stage in New York City in size. Much of the city, as well as Shriners from 12 states, turned out on November 3, 1923, to view the building's dedication. Abou Ben Adhem first met in the Baldwin Theater in Kansas City by officers of the Ararat Temple of Kansas City on October 15, 1903. The membership of the order is limited to Knights Templar and Scottish Rite fraternal organizations. In 1906 the Masonic Temple on East Walnut was built. On October 28, 1920, the membership voted to build a Shrine Mosque on St. Louis Street and Kimbrough. The site was purchased from the Frank Herman Saddlery Company. The Temple was built near the center of Springfield, both in its location and its spirit. 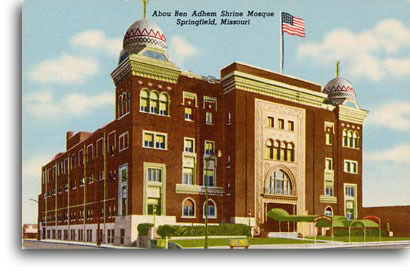 In addition to Shriners conventions, dances, circuses and other entertainments, the Mosque has also been the site of wrestling matches, Jackson Day activities, telethons, dance-a-thons, war bond drives, revivals, dog and cat shows, roller derbies and concerts featuring acts from John Philip Sousa to the Vienna Singers to Elvis Presley (whose concert, by the way, sold few tickets). Presidents Harry Truman, Franklin Roosevelt and Ronald Reagan also appeared there. The lower level of the Mosque contains a large room that can seat 1,300, special rooms for Shrine units and a museum. For a period in 1973-1975 there was talk that the Mosque might be torn down because it had deteriorated over the years, but in 1975 the Shriners announced that it would be renovated. In 1982 it was placed on the National Register of Historic Places. The renovation began in 1987.